This review first appeared in the February 2016 issue of high-end hifi magazine fairaudio.de of Germany. 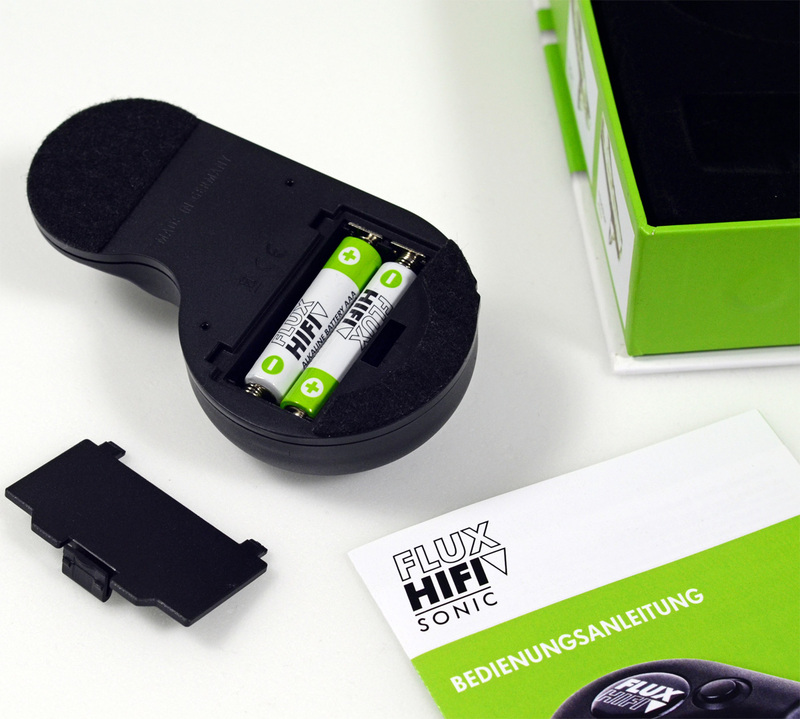 You can also read this Flux-Sonic review in its original German version. We publish its English translation in a mutual syndication arrangement with the publishers. As is customary for our own reviews, the writer's signature at review's end shows an e-mail address should you have questions or wish to send feedback. All images contained in this review are the property of fairaudio or Flux-Sonic - Ed. Wash your nub before you do it. No, this will not be an X-rated feature. Sorry. Sometimes it simply takes revival and refinement of an old idea to result in a product with nary any competition. I'm speaking of the Flux-Sonic needle cleaner. At least this reporter couldn't tell you who else today might offer another electronic brush to sparkle up a cartridge diamond. Cool, eh? True, the basic concept isn't new. Already 40 years we had similar. It's just that the intervening victory lap of the CD and the parallel benching of the vinyl record had shrunk demand for such accessories. Many of them simply disappeared. Today's hunter may have to hit up eBay or similar virtual classifieds to find used oldies à la Audio Technica AT-637. After 10-15 years of strong analogue revival, it's obviously high time now that this subject was revisited. So bubba... what have you done for your needle, lately? I think of myself as quite a normal vinyl user. During my analogue career, dozens of brushes have passed through my hands. The one that stuck with me is a most basic thing. It came, I believe, with the Denon 103 cartridge. It uses long soft synthetic fibres. Truth be told, those are a bit blasé about real cleaning but do handle the occasional long tuft; or dust off the entire cart real well. Most often I use a small carbon brush and expect most of you do, too. That design ought to be as ubiquitous as the classic two-part carbon brush for records. It packs its fibres so tightly that it really does remove more than any long-haired specimen could. And yes, I even still keep a liquid needle cleaner. That simply gets less play time. If it does, it's mostly together with the brush: micro drop it by one onto the brush, then 'scrub' very slowly. In principle, this already covered everything there's to say about the Flux-Sonic cleaner. Its brush head is a virtual stand-in for my carbon jobbie, albeit a bit larger. Also, you're supposed to first administer a drop of the included liquid onto it. That finally gets us to the part not repeatable by hand: push the button and the brush begins to vibrate like an electric Philips tooth brush. A nice extra is that this also lights up the landing spot of the needle. So, needle down onto the brush, let 15 seconds pass, lift the needle, presto. I can already hear the more sensitive souls twist in anguish. "Won't those violent vibrations damage my cartridge?" "Nonsense, we don't use strong vibrations" retaliates the maker. So let's talk fluxy facts. 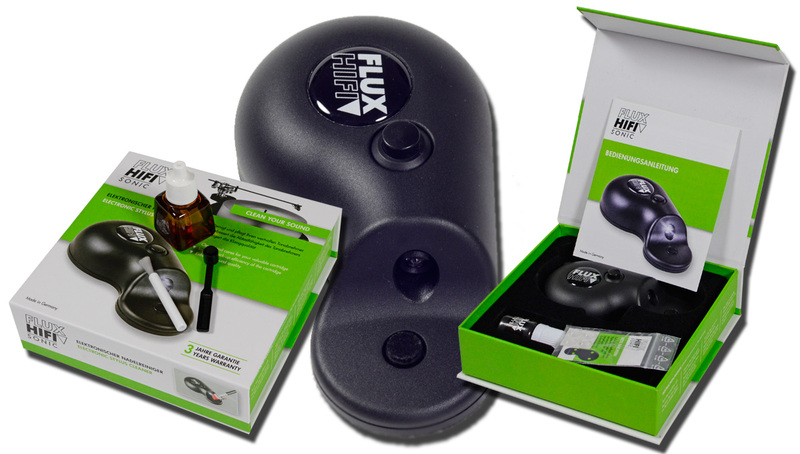 Flux-Sonic activate their brush head with a relatively low frequency of 222Hz along three axes. The attendant displacement, as per designer Topalovic, is far less than the needle ever sees in the record groove. To wit, 8µm in the X/Y axes, 1.4µm in the Z direction. Contrast that with the 50µm most records expose your needle to. Needle wear of the Flux-Sonic, over a few seconds, ought to be truly theoretical. That's different than the Audio Technica AT-637 of yore. That worked at ~40µm whilst competitors of the time threw up to twice that range of motion at the same task. What's more, Topalovic deliberately lowered his vibrational frequency for an ideal balance between care and cleaning efficiency. By the way, his fluid doesn't merely loosen encrustations. It also acts as a carrier of the vibrations into the needle for the full effect. This fluid is based on isopropanol not least because it evaporates afterwards. Don't dare fret about the needle or its glue: "In theory, alcohol might dry out the glue of truly ancient pickups. In practice, we're not aware of a single case where that's happened, ever." There. First contact. The initial thing to tickle my nether regions was the packaging. I'll keep that short to not cause you any palpitations but – such a cleanly executed professional box I might have expected with a SoniCare tooth brush but certainly not any hifi accessory. There I expect either bupkes; or some insane overkill à la interconnect on a silk cushion inside a solid-wood Ebony box with silvery corners. So consider these fine details for a moment. You can affix four rubber bumpers to our machine in lieu of the felt pads should those prove too slippery. Thoughtful. But here's the kicker. Those li'l rubber thingies don't fly around inside the box but show up in a little bag replete with a funny little instruction note – in two languages, mind, plus an info graphic. Even the included batteries are branded. Geezus, in a quarter century of hifi, I never saw that before. Neither am I used to manuals without misspellas. Heck, here I couldn't even find fault with a single comma. Granted, who cares in the end? I simply found such attention to minutiae appealing. Back on track. Or into the groove as it were. The German-designed and made Flux-Sonic looks a bit like an electronic tone-arm scale. It also weighs about as much; 70g with batteries. The only minor fly in the ointment could be—this will depend on your table, tone arm and setup—its height. For me the brush pad sat about 2-3mm higher than I could get my needle with the arm lift fully raised. The maker's suggestion to adjust the lift didn't work for me. I already sat at just about max. Suggestion #2 (to remove the platter mat) woulda worked splendidly especially since my current The Cartridgeman sliver is quite thick. His Music Mat is 6mm and an astonishing thing of super-soft squish which, totally counterintuitive, plays it actually more dynamic.